A honest display of feelings presented with a cool funky attitude! Sometimes its time to let go. Hi I am Jaden Sago. Over the years I have written and recorded a large catalog of songs, but for a number of reasons, the time was never right to share them with the outside world. The time has come to bare my soul to all and allow my private playlist to be introduce to those who would appreciate it. 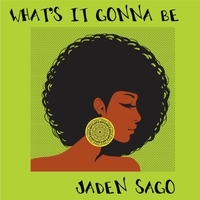 What's it gonna be will be available for streaming and download and in some cases for free like on the JadenSago.com website. If you choose to purchase my music those funds will go toward creating and promoting more music and other creations. Through it all I hope to be a positive light in a world that seems to grow darker each day. I write music to connect with people in a way that moves them. The same connection I felt with the music I grew up listening to. Love is a central theme in my creations and while some songs may tell a story of a love that has been lost, or reflect betrayal or conflict, I attempt to maintain the lyrical integrity while embracing sonic diversity. With influences ranging from James Brown and Stevie Wonder, to Earth Wind and Fire and Cameo to Micheal Jackson and the many shades of Prince, I am inspired to fold them into my own brand of funky pop soul with infectious grooves and striking melodies. While I have taken many paths in life, it was a lost love that finally illuminated the illusive truth. There was really only one true passion and it was music. Music was the only constant, and had always been the end goal. Now it is time to remove and disallow the distractions and to make music the only goal. Through Sonic Gumbo Music I hope to reach out to all who love music and the expression of love and emotion through sound. In this new age of digital music many of the barriers to the music business have been lowered. I truly believe there is an opportunity to allow music to stand on it’s own, judged on its own merits by music lovers instead by of which artist the label executive decides to support or the size of the label they are signed to. I look forward to sharing the music from my “Private Playlist” as well as the ongoing flow of New Material and collaborations with other artist.